The Black Keys haven’t made a proper video for their fired-up new jam “Lonely Boy” yet, but they did debut the song with a viral video in which some guy absolutely goes to town, dancing and lip-syncing to the track. Ellen DeGeneres is obviously a connoisseur of televised dancing, so she recently interviewed that dancer on her show. As it turns out, he’s a struggling actor named Derrick Tuggle, and he looked pretty adorably nervous-as-hell during the show’s interview segment; you don’t often see restless leg syndrome on network TV. 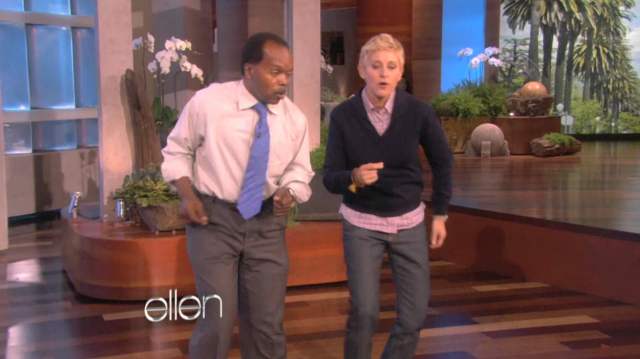 Tuggle, however, came alive when Ellen asked him to dance. The man can move. Watch video of him on Ellen, as well as the original Black Keys clip, below. The Black Keys’ new album El Camino is out 12/6 on Nonesuch. Their “Lonely Boy” b/w “Run Right Back” single arrives 11/15 in independent record stores.